Is also termed cardiospasm, is a major disorder of the esophagus in which peristalsis is reduced along the distal two-thirds of the esophagus. Achalasia is evident at the esophagogastric sprincher because of its inability to relax during swallowing. The thoracic esophagus may also lose its normal peristaltic activity and become dilated (megaesophagus). Video and rapid digital fluoroscopy is most helpful in diagnostis of achalasia. 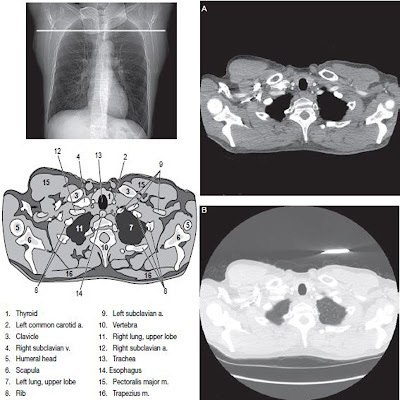 Anatomic Anomalies may be congenital or may be caused by disease, such as cancer of the esophagus. patients who suffer a stroke often develop impaired swallowing mechanisms. Certain food and contrast agents are administered during the examination for evaluation of swallowing patterns. A speech pathologist may witness the study to better understand the speech and swallowing patterns of the patient. Video and digital fluoroscopy is used during these studies. Is the replacement of the normal squamous epithelium with columnar lined epithelium ulcer tissue in the lower esophagus. This replacement may produce a stricture in the distal esophagus. In advanced cases, a peptic ulcer may develop in the distal esophagus. The esophagram may demonstrate subtle tissue changes in the esophagus, but nuclear medicine is the modality of choice for this condition. The patient is injected with technetium 99m pertechnetate to demonstrate the shift in tissue types in the esophagus. Includes one of the most common malignancies of the esophagus, adenocarcinoma. Advanced symptoms include dysphalgia or difficulty in swallowing and localized pain during meals and bleeding. Other tumors of the esophagus include carcinodarcoma, which often produces a large, irregular polyp, and pseudocarcinoma. Esophagram and endoscopy are performed to detect these tumors. The esophagram may demonstrate atrophic changes in the mucosa caused by invasion of the tumor as well as stricture. Computed Tomography (CT) may be performed in staging of the tumor and in determining whether it has extended beyond the inner layer of mucosa of the esophagus. Is difficulty in swallowing. Dyspalgia may due to congenital or acquired condition, a trapped bolus of food, paralysis of pharyngeal or esophageal muscles, or inflammation. 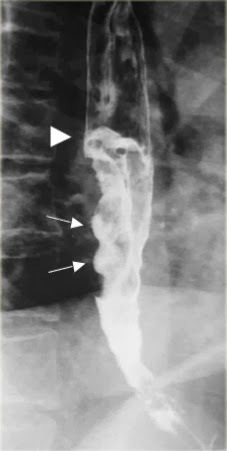 Narrowing or an enlarge, flaccid appearance of the esophagus may be seen during esophagram, depending on the cause of the dysphagia. Video and digital fluoroscopy is the modality of choice. These are characterized by dilation of the veins in the distal esophagus. Esophageal Varicies often seen with acute liver disease, such as cirrhosis due to increased portal hypertension. With restriction in venous flow through the liver, the coronary veins in the distal esophagus become dilated, and engorged with blood. In advance cases, the veins may begin to bleed. 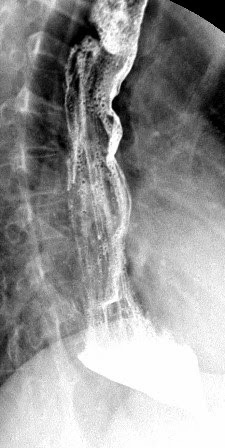 Advanced esophageal varices present with narrowing of the distal third of the esophagus and a ''worm like" or "cobblestone" appearance caused by enlarged veins during an esophagram. Of which patients may ingest a variety, include a bolus of food metallic objects, and other materials lodging in the esophagus. Their locaion and dimensions may be determined during the esophagram. Radiolucent foreign bodies, such as fish bones, may required the use of additional materials and techniques for detection. Cotton may be shredded and placed in a cup of barium and drunk by the patient. The intent of this technique is to allow a tuft of the cotton to be suspended by the radiolucent foreign body and visible during fluoroscopy. Although this technique has been used for decades, most gastroenterologist prefer the use of endoscopy to isolate and remove these foreign bodies. GERD is the entry of gastric contents in the esophagus, irritating the lining of the esophagus. Esophageal Reflux is reported as heart burn by most patients. This condition may lead to esophagitis, demonstrated by an irregular and or ulcerative appearance of the mucosa of the esophagus. The causes of Gastroesophageal Reflux Disease (GERD) or esophageal reflux have not been confirmed, cigarette smoking and excessive intake of aspirin, alchohol, and caffeine increase the incidence of reflux. Specific methods used to demonstrate esophageal reflux, one is the use of fluoroscopy. In advanced cases, the distal esophagus demonstrate longitudinal streaks during an esophagram because of changes in the mucusa. Endoscopy is often performed to detect early signs of esophageal reflux or Gastroesophageal reflux disease (GERD). Zenker's Diverticulum is characterized by a large outpouching of the esophagus just above the upper esophageal sphincter. Zenker's Diverticulum is believed to be caused by weakening of the muscle wall. 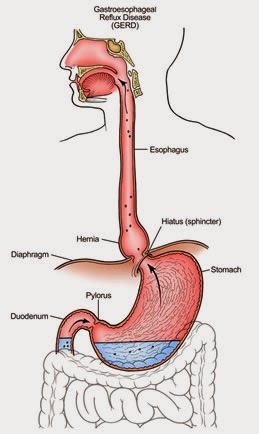 Because of the size of the diverticulum, the patient may experience dysphagia which is diffilculty in swallowing, aspiration, and regurgitation of food eaten hours earlier. medication to Zenker's Diverticulum can reduce the symptoms but surgery may be required.